Facebook has joined YouTube in offering 360-degree videos to the masses - and there's a brand new clip from Star Wars: The Force Awakens to help show off the newly launched feature..
As the name suggests, 360-degree videos let you peer in any direction while the action unfolds. You can view them in a VR headset, but they also work in web browsers (if you click and drag to view) and on standard smartphones (swipe or move the handset around). It's like a basic version of virtual reality, though you can't control your position in the scene and there's no depth perception (you feel like you're in a round bubble rather than an actual world). Content publishers like Facebook are positioning 360-degree video as a way into VR for consumers while we wait for the Oculus Rift, HTC Vive and other headsets to launch next year. It's relatively easy to make too. 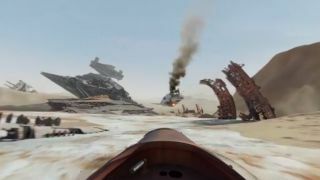 As for the new Star Wars clip, it lets you explore the parched surface of Jakku on a speeder and fly past a Star Destroyer sunk in the sand. It's an impressive use of the new tech and shows what's possible - click and drag to move the point of view around. The 360-degree videos are rolling out in the News Feed on desktop and Android now with iOS support coming soon. In the not too distant future you'll be able to peer in any direction inside your friends' holiday and baby videos (assuming they have a 360-degree camera, of course).